Astrophotographer Jeffrey O. Johnson took this image from his backyard in Las Cruces, New Mexico. Thick blankets of dust surround the predominantly dark region in Barnard 343, a dark nebula in the constellation Cygnus. 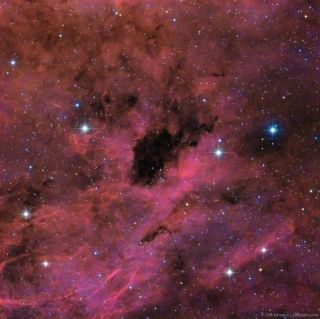 Barnard 343 belongs to the Gamma Cygni Complex – a group of clouds in Cygnus approximately 2,000 light-years away. A light-year is the distance light travels in one year, or about 6 trillion miles (10 trillion kilometers). The brilliant red regions are caused by a large amount of hydrogen emissions present in the visible part of the spectrum. Johnson used a Takahashi TOA-130F @ f/7.7 telescope with a Takahashi EM200 Temma II Mount with a QSI 540wsg @ -15C camera.